With the ISOMETER® iso685 series, Bender is providing an innovative range of insulation monitoring devices which comply with state-of-the-art technology in terms of reliability, measuring methods, usability and design. They monitor the insulation resistance to earth in unearthed systems (IT systems) and signal when the value falls below a specific limit value. By means of devices for automatic insulation fault location, which can be carried out during ongoing operation, it is now possible to find insulation faults even in large and widely branched IT systems. This minimises downtimes and significantly increases plant availability. The iso685-D-P variant can be used for systems with insulation fault location. Insulation fault locators of the ISOSCAN® series assign this locating current to a defective load using a measuring current transformer. 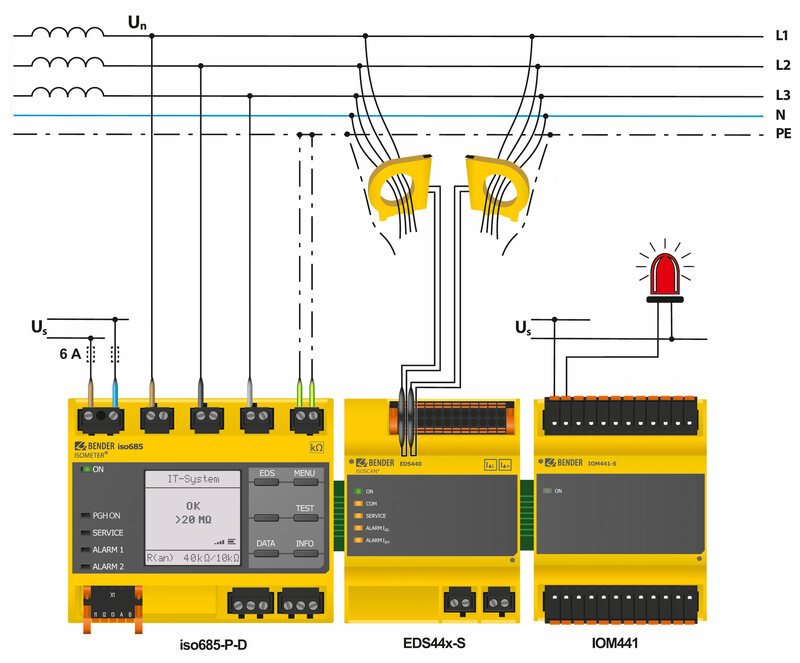 The iso685-D-P communicates with the EDS440 and EDS441 insulation fault locators via an RS-485 sensor bus or top-hat rail bus. The iso685-D-P insulation monitoring device can also be used in applications with coupled systems. Thanks to the EDSsync function, all iso685-D-P devices in a group and consequently also all EDS devices connected to it participate in the insulation fault location. This function is independent of whether the insulation monitoring in the coupled systems is performed via ISOnet or by disabling a digital input. The example in Figure 1 shows how the right iso685-D-P is deactivated by an auxiliary contact in the coupling switch as soon as the two systems are coupled. If one of the two devices detects an insulation fault, it automatically switches to insulation fault location operating mode. When the EDSsync function is activated, a search for insulation faults is performed simultaneously on both sides of the coupling switch, even if the right iso685-D-P is deactivated due to the closed coupling switch. Up to 50 EDS can be connected to an iso685-D-P. By combining EDS44x with the IOM441 input/output module, a potential-free contact can be made available for each EDS44x measurement channel. This enables messages to be generated or outputs with unimportant loads to be disconnected so that the IT system can maintain high availability for important loads. New measuring methods also make it possible to locate high-impedance faults with high system leakage capacitances and low locating currents. The faulty channels are indicated on the display of the iso685-D-P and can be replaced by plain text messages. This makes fault localisation even easier. The iso685-D-P can communicate via Modbus TCP, Modbus RTU and isoData. This ensures that the device can be easily integrated into existing communication solutions.